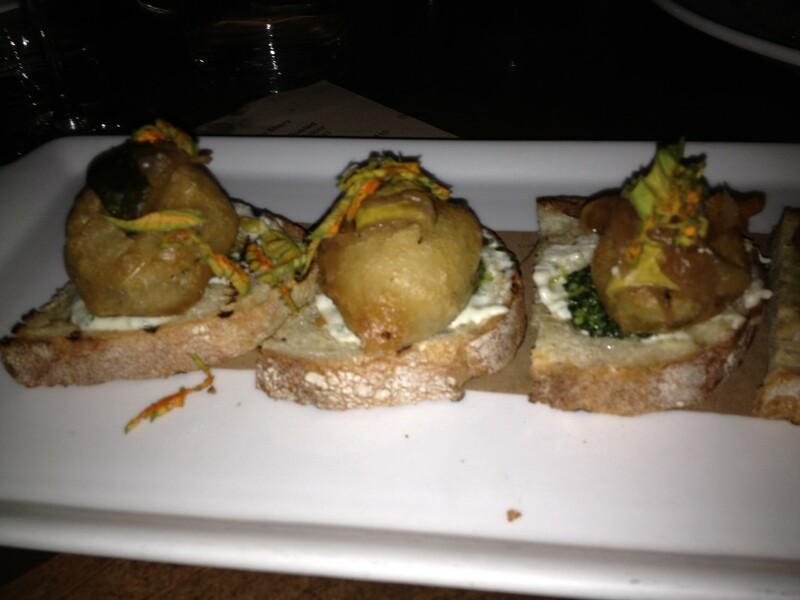 But I’m starting to tire of, and maybe even resent, small plates. I’m with five friends at Cork Wine Bar in Logan Circle. One of my friends remarks, “I miss the days when I had my own plate of food.” I have to agree. Why do I always need to share what I’m eating and turn a dish over to someone else before I’m ready? This feeling is intensified at Cork, where much of the food is so good that I’m not happy to part with it. We are seated upstairs and enjoying the fact that the noise level up here is manageable. On the other hand, it is so dark that using a flashlight to read the menu is mandatory. We are relieved to see that a young couple at an adjacent table is also resorting to supplemental lighting. We eagerly interpret this to mean that our inability to see isn’t necessarily related to our age. Things start off a little rough. We don’t love the bottle of wine we’ve selected. Since Cork has a selection of 50 different wines by the glass, perhaps sharing a bottle of wine isn’t the way to go. Rookie mistake, and we’re a little disappointed. However, as our dishes begin to arrive, we settle into a happy groove. 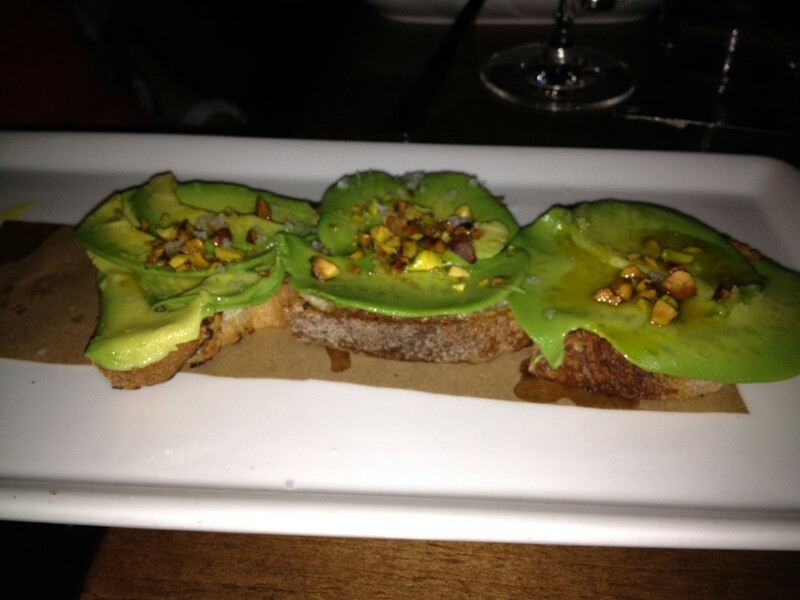 Avocado with pistachios, toasted pistachio oil, sea salt, and grilled bread quickly makes us turn our attention to the food. Avocado lovers take note: don’t miss this. The avocado is a deserving star. I am not a fan of calamari, so I don’t think I’m going to partake in this particular dish. But I can’t resist when I hear the reactions of my fellow diners, which include a series of oohs and ahs. I gingerly take a bite and then happily take a few more of the light and crispy tendrils. Thankfully, we’ve ordered a large portion and my friends are willing to share. 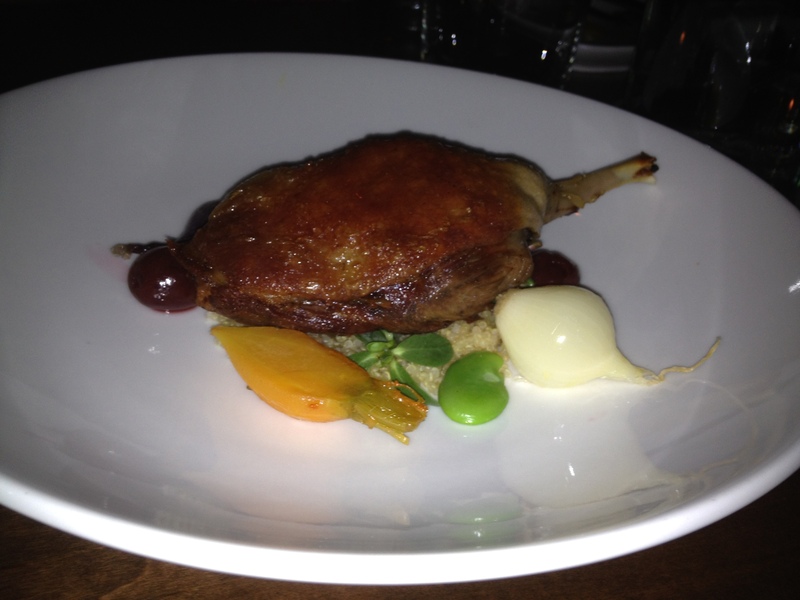 Duck confit with fava beans, carrots, pickled cherries, and quinoa is another winner. I’m grateful that only four of us are splitting this, as it gives me a better opportunity to savor the flavor. The group order results in two dishes that I’m not terribly excited about: marcona almond and carrot salad as well as arugula salad with basil, mint, figs, shallot vinaigrette, and parmesan. They both end up being terrifically fresh and far more complex than I could have imagined. 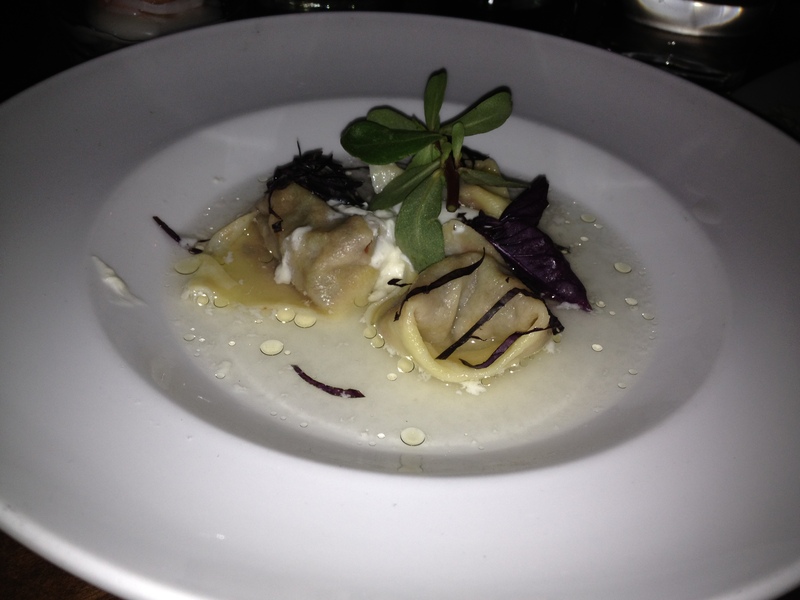 Tortellini with tomato confit, shallots, and tomato water is a special. This sounds so good that we order two. The portion is small, so I’m a bit wistful after biting into a tortellini that bursts open to dispense a delicious savory liquid. I find one dish fairly distasteful. 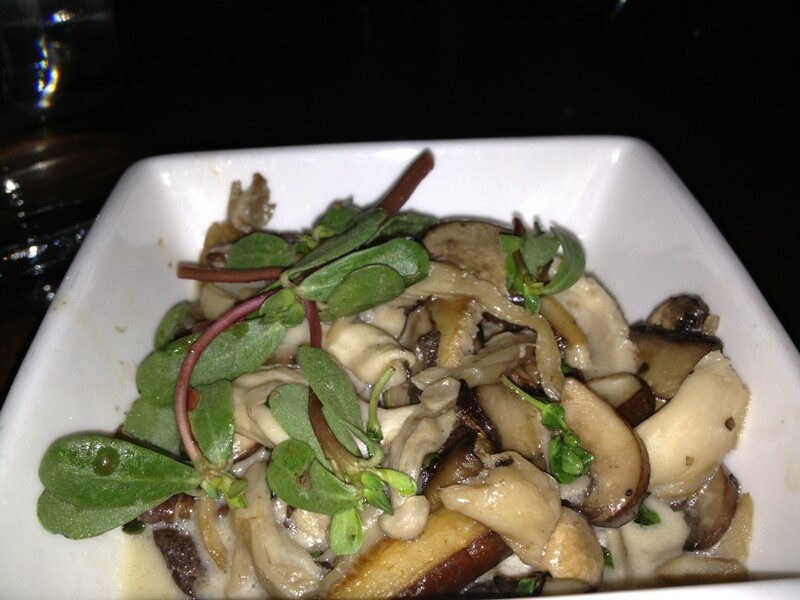 The sauteed exotic mushrooms with Madeira and marjoram are too salty. Our server overhears our comment, and without a word another portion is delivered to our table. The second order has less salt, but I still find the flavor somewhat soapy. The opinion of the group is split. Some enjoy it. In this case, I happily forgo my portion. I have to leave before dessert but I’m told that this is a highlight of the meal, particularly goat cheese cake with fresh berries and cookie crumble. I’m sad to have missed out, but hearing this means that I am resolved for a return visit that’s sooner rather than later. There really is nothing more satisfying than sharing a meal with others. At Cork, I’d simply prefer the sharing to be a little less literal.